I read this book in one eight hour sitting because I was down to the weekend before The Hot Chicks Who Read, my book club, were getting together to discuss this book. Thankfully, my husband had the crud that’s been going around, and I was able to spend the entire day focused on this book. Boy did I need it! The author’s writing style was very detailed and every sentence had meaning to the story. If I had not spent those consecutive hours delving into these characters minds, I think I would have missed some nuances of this very well written, psychological thriller. The following synopsis was taken directly from Amazon.com. The author’s premise of a woman who writes a book telling women that they have only themselves to blame if their husbands aren’t who they thought when they got married made my group not like the character of Grace initially. I know I didn’t. As the book goes on, and Grace has become the pupil her book is directed at, instead of the teacher, you start to feel bad for her. I don’t want to give any plot points away, but at one point you really wonder how, as a Counselor to others, she missed all of these signs in her own relationship. It was only after she rallies around her son, and her relationship with her father is repaired do I start to believe that she has learned her lesson, and I’m able to embrace her character. I truly believe that this was the author’s purpose. 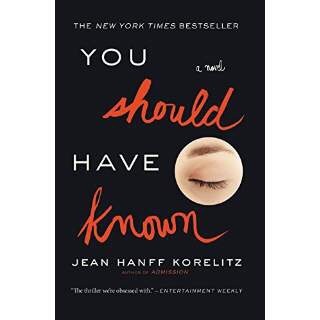 Jean Hanff Korelitz put the ring in my nose and led me down this psychological pathway. We, the reader are supposed to hate the protagonist, even though she isn’t a horrible person. Bravo, because all of my group did, and some carried it through to the end of the book. This doesn’t mean we hated the book. Far from it, in fact! We were all uncomfortable witnessing the naïveté Grace exhibited, and angry that she wore such big blinders. I was fascinated with the fictional book that Grace was writing. Do we women also put blinders on when we enter a relationship? Are we so happy to have found a man to settle down with, who will accept the faults we see in ourselves, and hope he doesn’t see them, and overlook his faults? It made all of us think back to the beginnings of our own relationships. Of course, at our table, none of us disclosed those faults, but we all nodded in agreement that some were deemed not as important. That was a fascinating side note to the book club discussion, which is part of what makes them so fun. The unwinding of the mystery surrounding the disappearance of Grace’s husband was exacting in its precision. I recommend this book to those of you who love psychological thrillers. This is a very good one, and the author makes every detail count, so don’t skip anything!